An East-End artist’s heartfelt warning against the dangers of passing on sectarian attitudes to children has scooped first prize in a competition ran by campaigners. Kelly Coyle’s photo ‘Torn’ was chosen as the winner of Nil by Mouth’s ‘Pitch Perfect’ art competition held in conjunction with Glasgow Kelvin College. During 2017 the charity worked with art students from the college highlighting the impact of sectarian behaviour on society and challenging them to come up with artwork which would hammer home this message to the public. The entries were judged by acclaimed Glasgow artist, and leading member of the New Glasgow Boys, Adrian Wiazniewski who decided that Kelly’s piece conveyed the most powerful, and dramatic message. Kelly grew up in the Gallowgate and Bridgeton areas of the city and used her experiences to shape the piece. 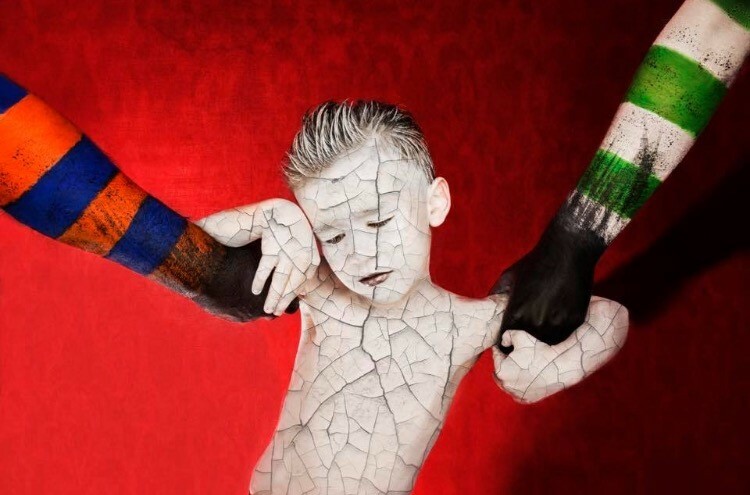 The photo highlights a young boy being pulled in different directions by those eager to claim him as ‘their own’ with little thought to the child’s right to choose its own path in life. ‘Torn’ was today unveiled at the St Mungo Museum of Religious Life and Art where it will be on display to the public over the next 12 months thanks to support from Glasgow Life. Nil by Mouth was set up by former Evening Times ‘Scotswoman of the Year’ Cara Henderson in response to the brutal sectarian murder of her friend Mark Scott as he made his way home from a football match in 1995. Since then the charity has delivered hundreds of workshops, events and programmes to tens of thousands of people right across Scotland. ‘We have always found that our most effective campaigns are those which harness the creativity and imagination of young people and the quality of the artwork produced by Kelly and her fellow students was fantastic. ‘Torn’ is an extremely powerful piece of art which doesn’t seek to dismiss anyone’s religious belief or cultural background but instead asks the viewer to stop for a moment and consider the impact of our behaviour on our children. If we use sectarian words, chant sectarian songs or behave in a sectarian manner in front of children are we are passing on a positive version of our identity or are we simply encouraging them to hate others?